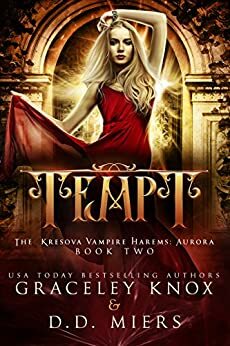 Book 2 Tempt in the Kresova Harem: Aurora by Graceley Know and D.D. Miers. Aurora is having nightmares of Abe and Abe is pushing for her to find him. He is lost and has to be found in order to stop Morana. Morana requires that Carver visit her for a short stay that turns into a month apart. Aura hasn’t been with one of her men, since Lucian isn’t hers with his engagement to someone else. But once Carver finally makes it home, disaster strikes the girls house in New Orleans. A fire starts mysteriously burning the majority of the old house. When the group retreats to one of Carvers safe houses, they learn that they weren’t as safe as they thought and that Morana knows exactly where they are. Morana requires the presence of not just Carver but also Aura for the centennial event happening in Paris. Abe’s dreams are getting more intense, cause Aura the desire to not sleep, especially when Carver has to wake her from the nightmares. But with the help of Lucian, who seems to becoming more in tune with the future that has already been planned for him, the group heads towards Paris and the party that awaits them. Staying in one of the many vibrant homes that Carver owns, Morana tries to dictate what will happen with Aura. Knowing that it is better to pretty ignorance than take her on at this time, Aura lets her unhappiness fester for the greater good of the Kresova. Will Aura’s dreams point her to Abe, can it be that easy and what does Morana have in store for her with her centennial gala? This is such a great series. Seeing the dynamics between Aura and Carver always make for a steamy read. And with Lucian coming around more, Aura has plenty to handle. I like how the newest character was introduced without ever really doing it. The writing between Graceley and D.D. is sure smooth and you can’t tell who wrote what part. Its great to see the growth in Aura from book one where she was just learning about being a vampire to this book where she accepts her fate, even if she doesn’t always like it. The story builds and the descriptions for not only the locations, but the rooms (once you read you will totally know what I mean) have such great detail. Grab Thirst if you haven’t read it yet and check out my review here.